In 1931, E. Maurice Labovitz opened a small women’s clothing store in Duluth. 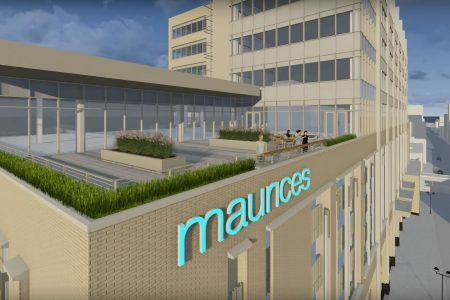 Now, the new headquarters of the Maurices retail chain is the largest downtown development in Duluth’s history. 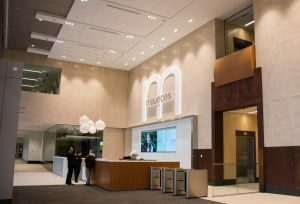 Employees on Monday began working in the $80 million office building. “We are so thrilled to move to our new headquarters in downtown Duluth — just a few blocks from where Maurices was founded 85 years ago,” said Laura Sieger, associate vice president of communications, in a statement. The 200,000 square feet of office space at 425 W. Superior St. spans an entire block and includes many modern touches such as a fitness center, large glass windows and an outdoor plaza that overlooks Lake Superior. “It demonstrates the potential that Duluth has now and moving into the future,” said Pakou Ly, the city’s public information coordinator. To Kristi Stokes, president of the city’s Greater Downtown Council, Maurices’ move is a sign of the surge of economic development that is currently happening in Duluth. She said she believes it will also help spur future development. Stokes’ organization, of which Maurices is a member, has been an advocate for the project. Stokes pointed out other recent downtown investments such as the new Duluth Transportation Center, completed earlier this year, and the $29 million Pier B Resort, which includes a 140-room hotel that will open in June. Previously, Maurices workers had been spread out in three buildings, including the original store building. Half of the company’s 450 corporate employees started working in the new building Monday, with the other half scheduled to move next week. The new offices have enough room for 600. 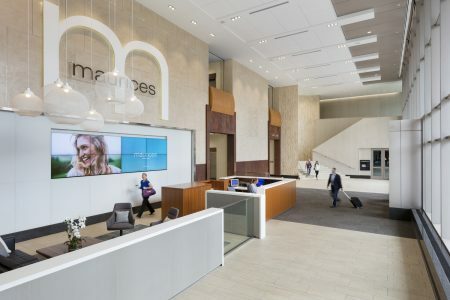 Maurices, which has more than 950 stores throughout the United States and Canada, is a brand of Ascena Retail Group, which also owns Ann Taylor, Lane Bryant and Dressbarn. The new building will provide space not only for Maurices but also for support services for Ascena’s other companies. Minnesota Power Employees Credit Union and Blue Cross and Blue Shield of Minnesota also are leasing space in the building, which was bought in 2013 from commercial real estate agency the Atwater Group. A public parking ramp with about 500 spaces is on floors 3 to 6 of the building, a welcome addition in the western end of downtown. The ramp is owned and operated by the city of Duluth. 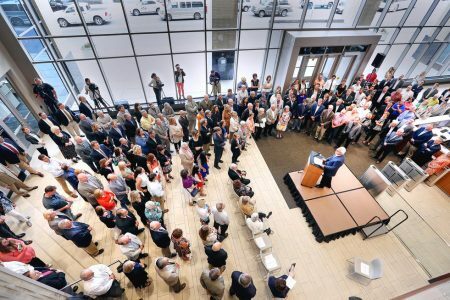 The city and the Minnesota Department of Employment and Economic Development contributed about $20 million for the public parking ramp and skywalk infrastructure through a matching grant program.